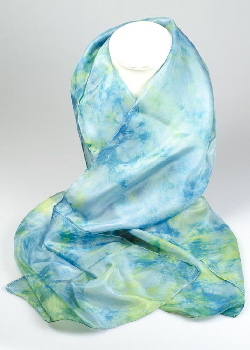 Buy our new 100% silk scarves hand dyed with natural dyes. Silk scarves not only keep you warm in winter and cool in summer, but they are the epitome of chic and add a touch of glamour to your outfit. Choose a scarf for yourself & for a friend and wear the magic of pure silk dyed with natural dyes next to your skin. And they make a great gift for friends living abroad as they are very light to post! Click on a photo to read & to buy! Read more about our silk scarves here. Our silk scarves are now Out of Stock on Wild Colours but you can buy them from Traditional Dye Works! The scarves are made of fine pongee silk (also known as China silk), a plain weave silk with a soft sheen and a great drape. These silk scarves are rectangular and measure approximately 150 cm by 40 cm (59 by 15½ inches) in size and have hand-rolled hems. A spellbinding mixture of soft greens and blues inspired by the sea; you can almost hear gentle waves breaking on the shore. Your Sea Mist silk scarf is dyed with natural Mayan indigo and weld. A green as fresh as mint for this beautiful green silk scarf. Your Mint Green silk scarf is dyed with natural Mayan indigo and weld. Cerise is a deep and sumptuous reddish pink. It will add a touch of luminous luxury to any outfit. The colour cerise is the bluer colour of cooked cherry, such as cherries in a pie, rather than the colour of fresh cherries, which is described by the redder colour cherry red. Your Cerise silk scarf is dyed with Peruvian cochineal. An old rose shade, with a hint of lilac. Beauty and class in pure luxurious silk. Your Rose silk scarf is dyed with Peruvian cochineal. A scarf dyed in gorgeous shades of mauve with splashes of violet. This beautiful combination of colours complement each other perfectly in a sophisticated, eye-catching scarf. Your Tropical Orchid silk scarf is dyed with Peruvian cochineal and natural Mayan indigo. A deep colour with subtle shades of purple and blue. A must for those who like darker and richer colours. Your Deep Purple silk scarf is dyed with Peruvian cochineal and natural Mayan indigo. A deep gold background with a spray of reddish golden dust. An incredibly warm shade with a touch of Eastern magic. Your Dark Gold silk scarf is dyed with onion skins (but, no, it doesn't smell of onions...). A light gold background with darker splashes of gold colour. A subtle combination of golden hues into a gentle translucent design. Your Gold Leaves silk scarf is dyed with onion skins (but, no, it doesn't smell of onions...). Our collection has been dyed with indigo, cochineal, weld and onion skin. These beautiful silk scarves have been dyed exclusively for us by Traditional Dye Works.